The Ministry Forum at Grand Canyon University is designed to provoke thoughtful discussion on a variety of spiritual and theological topics. The 2016-17 offerings should be especially thoughtful — and provocative — with hot-button topics ranging from social justice to religious liberty to immigration. Organized and managed by the College of Theology, the Ministry Forum meets three times per semester, always at 5 p.m. on a Monday, and is open to anyone on campus. All of this year’s gatherings will be in Howerton Hall (except Jan. 23, which will be in the Colangelo College of Business lecture hall). Pizza and refreshments will be served. 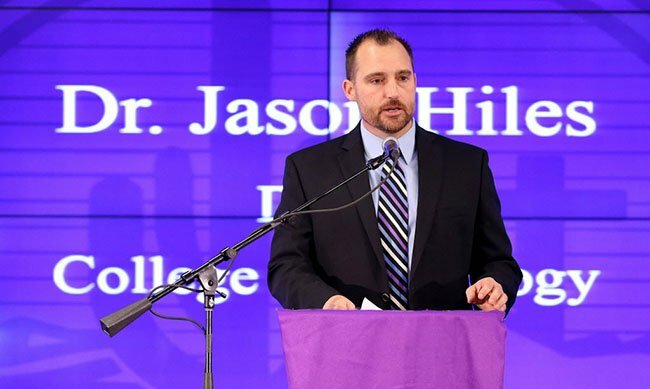 “Ministry Forum began almost three years ago as an effort to bring Theology faculty and students together for relationship-building and mutual encouragement,” said Dr. Jason Hiles, the Theology dean. “The Forum also helps us connect students with pastors and other Christian leaders who have wisdom to offer on critical topics. “Over time the gathering has grown in numbers and in strength. Faculty share from their hearts and students interact with them and their peers. At the end of each academic year, we turn it over completely to students and allow them to present original research. Sept. 19 — God’s Concern for the Poor: What’s Missing in Social Justice? The Bible is filled with references to the eternal struggles of the poor and the sins of the rich. This session will look at the vision of God’s justice in social systems and how a social order can best implement that vision for the glory of God. Religious liberty is a foundational freedom of American society, but the cultural climate has become increasingly hostile toward many faiths. The Biblical, historical and practical dimensions of the subject will be explored. Nov. 14 — Does God Call Women into Ministry? This topic has caused division in many churches, and it raises an interesting dilemma: What should a woman do if she believes that God has equipped her and given her a passion for service? The discussion will focus on what influences people most when they form an opinion about the subject. It has been one of the key issues of the political campaigns, but the evangelical church has been relatively quiet about what the Bible says about it. What is the perspective from a Biblical and theological standpoint? Pastors and professors will have an open conversation. It’s a topic that most Christians, let alone most Americans, don’t agree on, and the progressive leanings of gender and sexuality attitudes have stirred considerable debate. The session will look at how God’s word might illuminate this identity crisis. Students will write papers presenting an argument on one of these five topics, and the three finalists will get to read theirs aloud for peers and faculty. “This year’s topics are immensely practical and stem directly from theological conversations we hosted in prior years,” Hiles said. “Students continue to wrestle with the challenging issues of our day, so we’ve decided to join the struggle by engaging tough topics. Lord willing, we’ll bring more light than heat to potentially contentious issues.